Pretty nasty stuff, right? I mean, if you can’t pronounce it, why on earth are we using it? Does it really do that good of a job cleaning? For me, it didn’t. I used to try everything on the market, especially in my coupon days and I found they all pretty much worked the same. As in they didn’t. We have very hard, high iron, well water and it takes a lot to get our dishes clean. And, the commercial stuff just wasn’t cutting it. An when I really started researching the chemicals, I knew that there had to be another way to get our dishes clean! 1 cup of borax, 1 cup washing soda, and 1 cup citric acid and I place in a covered jar and gently shake! That’s all! 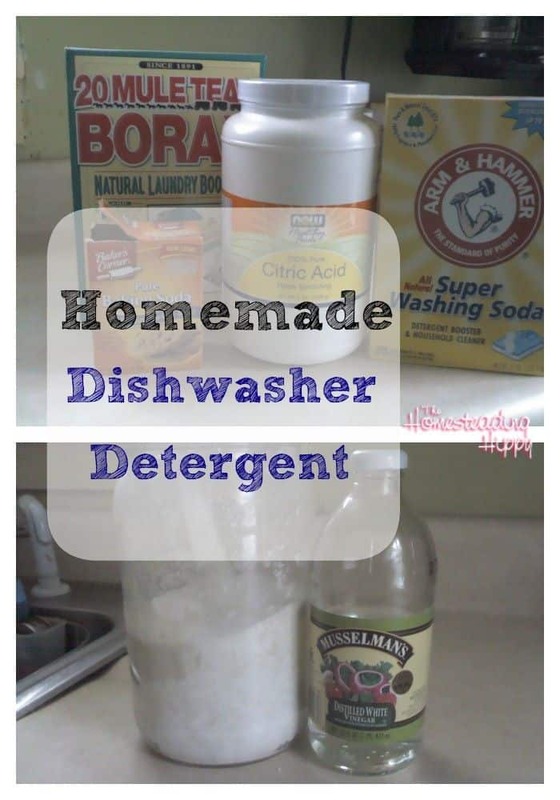 Add 1/2 cup plain white vinegar to the rinse cycle and there you go! I figured that this cost me only a few dollars to make…and this batch will last about 4 weeks, using 2 Tablespoons per wash load. The best part of this was that it really worked on caked on food and grease, which is good because my kids aren’t the best at prerinsing. I didn’t have to worry about any type of nasty residue being left over and getting into our food and bodies.